When I left Cincinnati yesterday morning I did not expect to be sleeping so close to Dickinson’s Homestead last night. Before leaving home I had written the draft of “A Blog for Emily (and Herman),” intended as an introduction to this blog when it is posted on the Dickinson Electronic Archive. 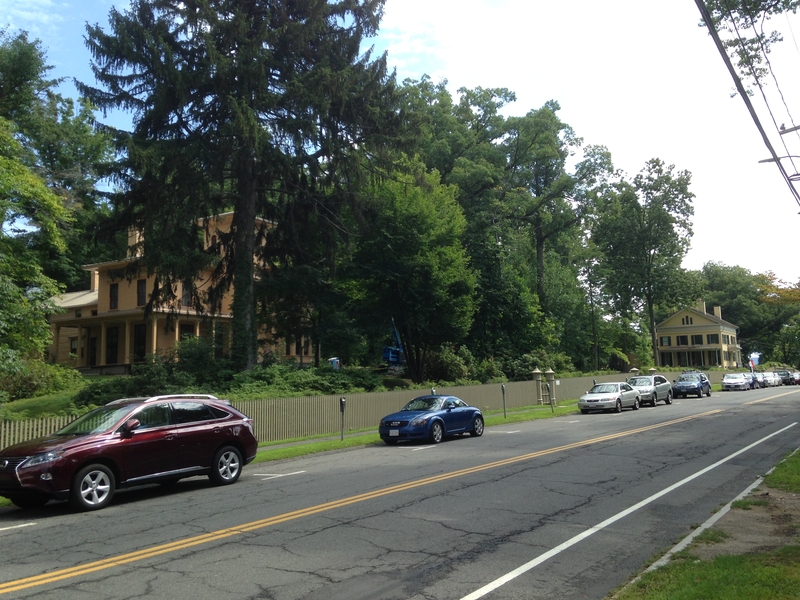 Noting that I am not a Dickinson scholar but only a teacher, I wrote that I am “entering the Amherst mansion, as it were, through the back door.” And now, last night, I had entered the city itself from the back door, feeling my way up highways 118 and 9 in the dark until I saw my first sign for Amherst. Today was Herman Melville’s birthday in the year 1819. In 2019 we will be celebrating the 200th Anniversary of his birth with the Twelfth International Melville Society conference, probably in New York City. Here in Lenox I am about seven miles from where he lived at Arrowhead in Pittsfield, occasionally riding a horse over here to Lenox to visit his friend Nathaniel Hawthorne, in a cottage near today’s Tanglewood Music Center. 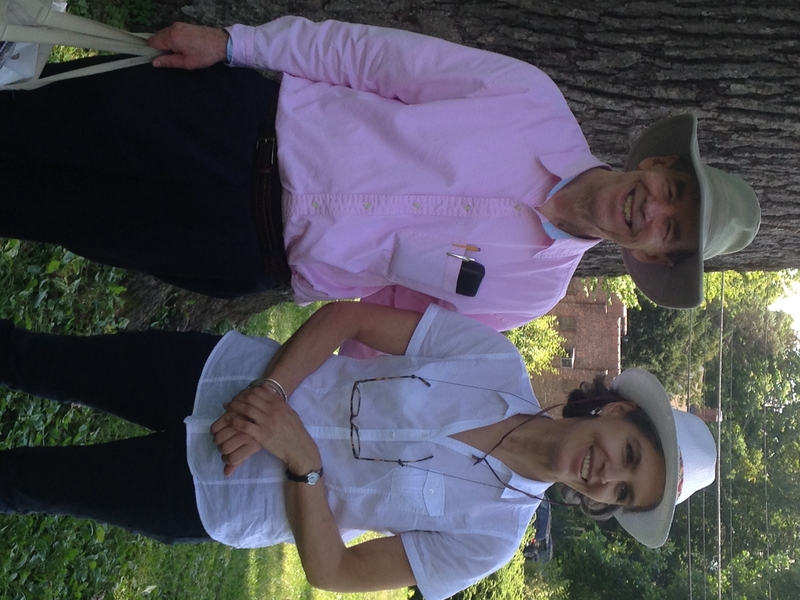 Tomorrow I will be at Tanglewood to hear a newly commissioned piece by Betsy Jolas, mother of Claire Illouz, my traveling companion today from Emily Dickinson’s house in Amherst to the Tanglewood cottage at which her mother has been staying while rehearsing with the young musicians who will be premiering her new work tomorrow. Her new work, entitled Rambles, is based on Mark Twain’s story about The Mysterious Stranger, which she will narrate while the young chamber performers play the music. I will return to Betsy, whom I have this evening met for the met for the second time, after I describe my day with Claire at the Dickinson Homestead, the family house in Amherst in which Emily was born and died, living there for nearly all of her life in between. 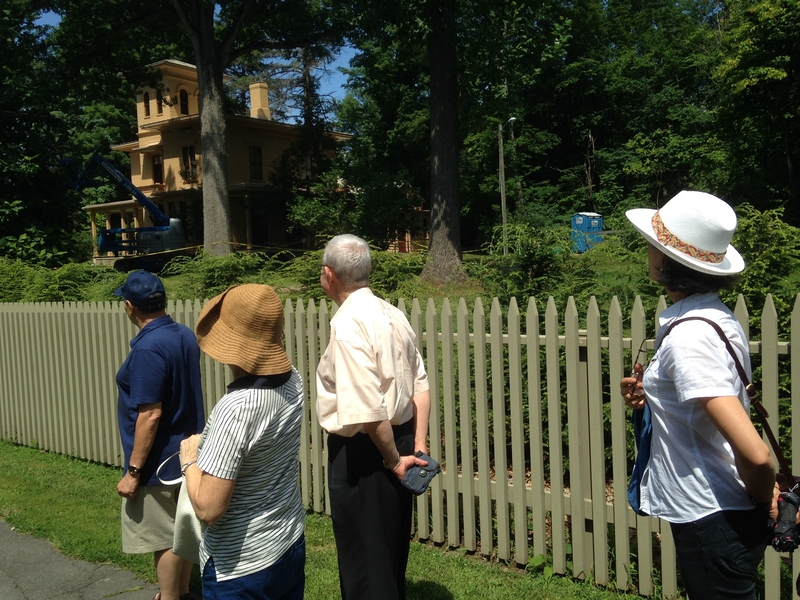 This house is the first half of a tour that also includes the Evergreens, the ornate Italianate house of Emily’s brother Austin and his wife Susan Gilbert Dickinson, who had been Emily’s closest friend until Susan married her brother. Claire and I had planned to meet at the Dickinson Homestead at 11 in the morning, she having stayed overnight in Boston after her flight from France before driving to Amherst with Marsha Pomerantz, an editor and poet. I had gone back to sleep after writing my impromptu homage to Jay Leyda in the middle of the night, sleeping in until 7:30 before going down to have breakfast in the lobby of the motel. 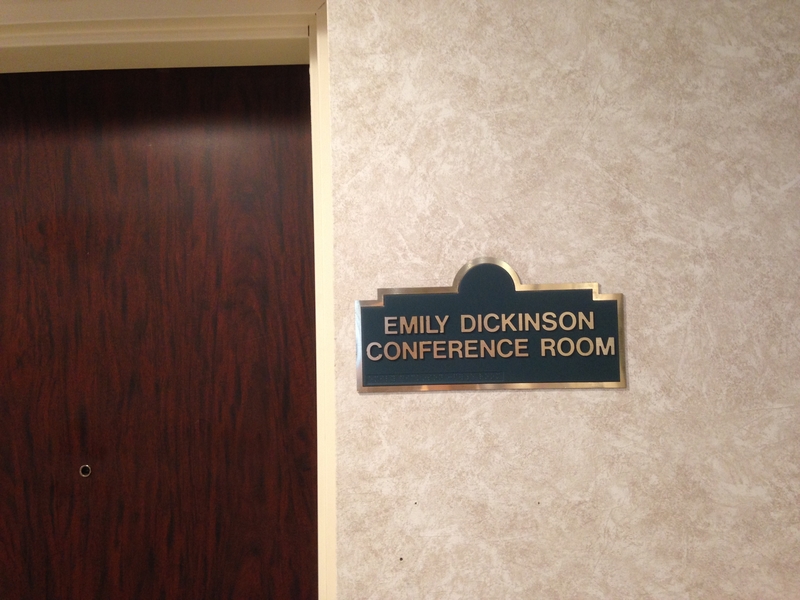 I knew I was in Emily’s orbit when I saw her name on the motel’s first-floor conference room. After breakfast I had time to read and take notes on two more excellent chapters of Sewall’s Ballots for Freedom, whose chronology now begins to link up very well with the events I have been writing about in Cincinnati. Since getting this book last Thursday, I have been wondering what relation, if any, its author Richard H. Sewall might have to Richard B. Sewall, who published his pioneering two-volume Life of Emily Dickinson during the same decade in which his namesake published Ballots for Freedom. I have just now got hit with exhaustion from a full and wonderful day. I’ll finish this entry in the morning when I am fresh. Today is my birthday, number 71. 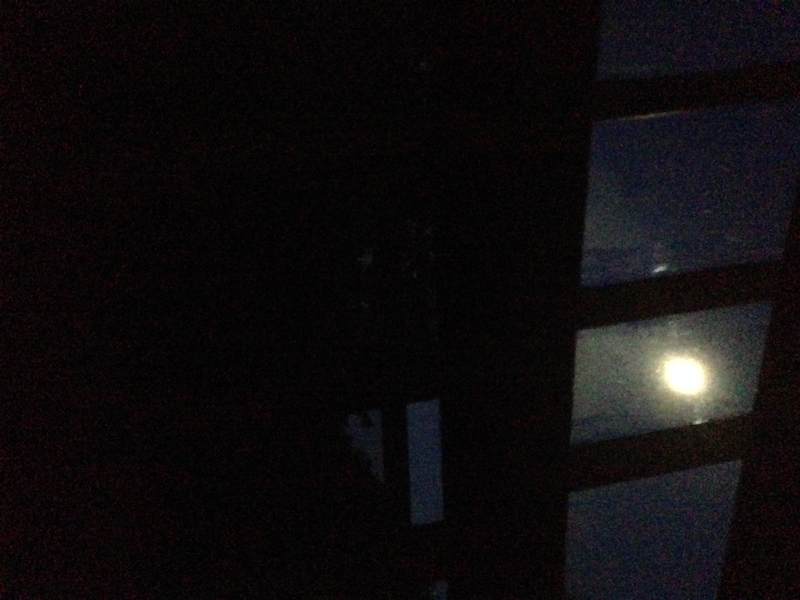 Last night when I left Claire and her mother at the Composer’s Cottage at Tanglewood, they were wondering if they would be able to see the full moon before going to bed. I saw it when I got up, briefly, in the middle of the night. The light this morning when I took an invigorating walk before breakfast was bright and clear. 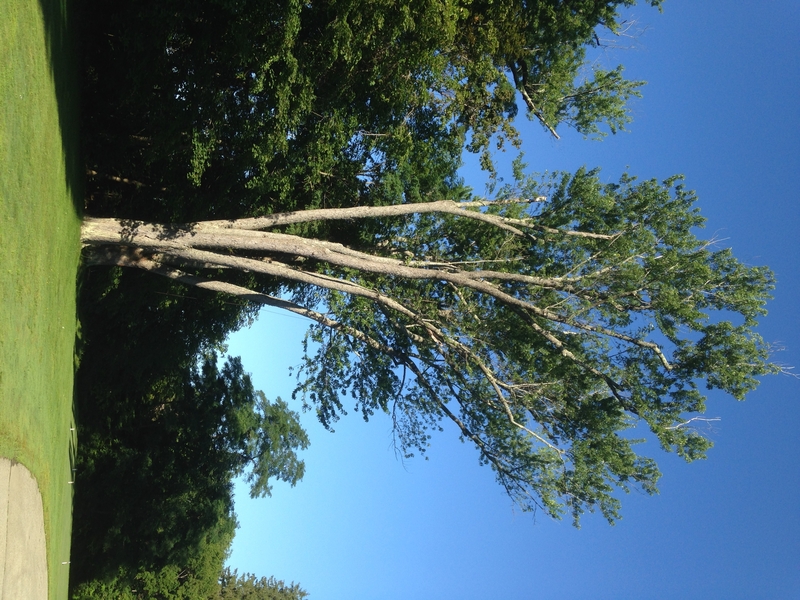 I was struck again and again by the brightness of its shine on the half-shaded trunks of the trees I passed. This may be a metaphor for my pleasure at being alive and ambulatory at my current age. Betsy Jolas is perhaps an unattainable role model at age eighty-nine—still apparently as nimble in body as she is in mind and spirit. Her chamber quintet Rambles will have its premiere in about ninety minutes only about a mile from where I am writing this entry. Nowhere was this morning’s light brighter than on the parchment-like skin of the two elm trees across the lawn from the porch on which I am writing. But now back to yesterday. I came into downtown Amherst on South Pleasant Street, passing an outdoor farmer’s market before turning down Main Street to the Dickinson house. The Homestead is not hard to find, fronting on Main only a few blocks after turning down from South Pleasant. The Evergreens is even closer to downtown, slightly withdrawn under its namesake trees. I have to stop here to get ready for the Sunday morning concert. The porch in Lenox is still slightly chilly in the morning air. Immediately beyond the porch brilliant yellow flowers are glowing in the morning sun. One bee has brought in his burnished carriage to savor the morning’s delights astride one flower’s field of light (J 1339). I have driven straight to this café from the three-hour morning concert at Ozawa Hall featuring Betsy Jolas’s Rambles and five other pieces, two of them world premieres, all of them beautifully performed. I will return to that concert after completing this entry on our day in the Dickinson world in Amherst. Greg, our tour guide, was perfect. He wore his extensive knowledge lightly, but with passion, especially when citing the poetry. He framed the tour in our first room in the Homestead, the one with the piano, with a quote from Harold Bloom comparing Dickinson with Shakespeare for cognitive strength among all English-language poets (which is exactly where I put her when teaching). It is always great to be in the space where she lived and thought, always with a new group of people savoring her ostensibly strange and wonderful story. This time I got to look more closely at the oil painting of Emily, Vinny, and Austin by a small-town itinerant painter. 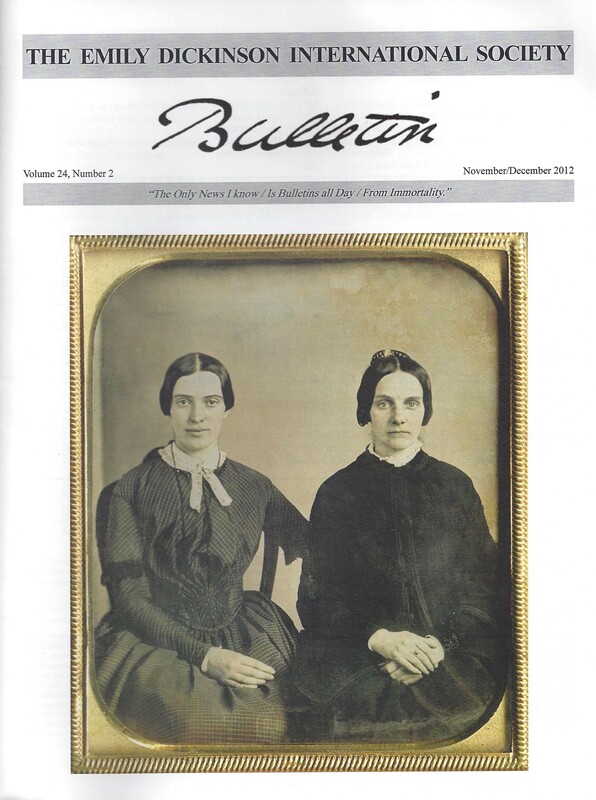 Greg, after having turned our attention to a good reproduction of the well-known daguerreotype of Emily at age sixteen, showed us the reproduction of the new double daguerreotype on the cover of a recent Emily Dickinson International Society Bulletin, suggesting (as I believe too, though it has not yet been proven) that the figure on the left is Emily in her twenties (this being the issue of the Bulletin including the essay I co-authored with my student Nicci Mechler). Crossing the entrance hall, Greg led us into the library, where he did an excellent job discussing Emily’s relationship with Samuel Bowles and Thomas Wentworth Higginson in relation to their interest in her poetry. Next to a photo of Higginson on a table was the issue of the Atlantic Monthly to which Emily had responded when Higginson had invited queries and submissions by young poets. One thing new for me in this room this time was the emphasis on the Homestead as a working farm during the decades in which the Dickinsons lived here. The way the farm worked was suggested by a large painting or engraving on the wall and by a multitude of telling details from Greg. He also mentioned a little about Lavinia’s and Martha Bianchi’s interest in publishing Emily’s poetry after she died, referring to other publications by Martha on one shelf of the bookcase to my left, an element of her life that was new to me. Up the staircase we saw, first, the replica of the famous white dress. It is now surrounded by artifacts I had previously seen in Emily’s bedroom—the portraits of George Eliot and Elizabeth Barrett Browning, Emily’s chair, her writing desk, and rocker. These are out in the hallway because great progress is now being made in the renovation of the bedroom itself. Wallpaper installed by subsequent residents has been fully removed, revealing enough remnants of the original wallpaper design to inspire new facsimile pattern soon to be installed. The floor is similarly far along in the restoration process, evidenced by the matting that currently covers the floor of most of the room. Although only the bed, over in the corner, currently remains of the room’s nearly holy artifacts, the absence of the others makes it possible to savor, more than ever before, the spatial dimensions of the room itself and the generosity of its light-giving windows. Even empty of its artifacts, this room is the classic embodiment of Virginia Woolf’s “A Room of One’s Own.” Since no photos are allowed inside the house, I will represent the famous white dress here with the White Poem Dress that Lindsey Alley created in my 2014 Spring Semester class. In contrast to the now empty room, I am posting below the view that Hilda Weaver imagined on one page of her artist book during the 2012 Spring Semester. Taking us across the hall way to the room on the other side of the dress, Grey said, “This room is always everyone’s favorite because you get to sit down.” Sitting was a pleasure, but so was the imaginative way this room has been set up to demonstrate Emily’s concern for precision in diction and resonance of sound. Mounted on the wall to the left of the doorway is the reproduction of a Dickinson poem punctuated by a sliding panel for any word in the poem for which Emily had written more than one option. 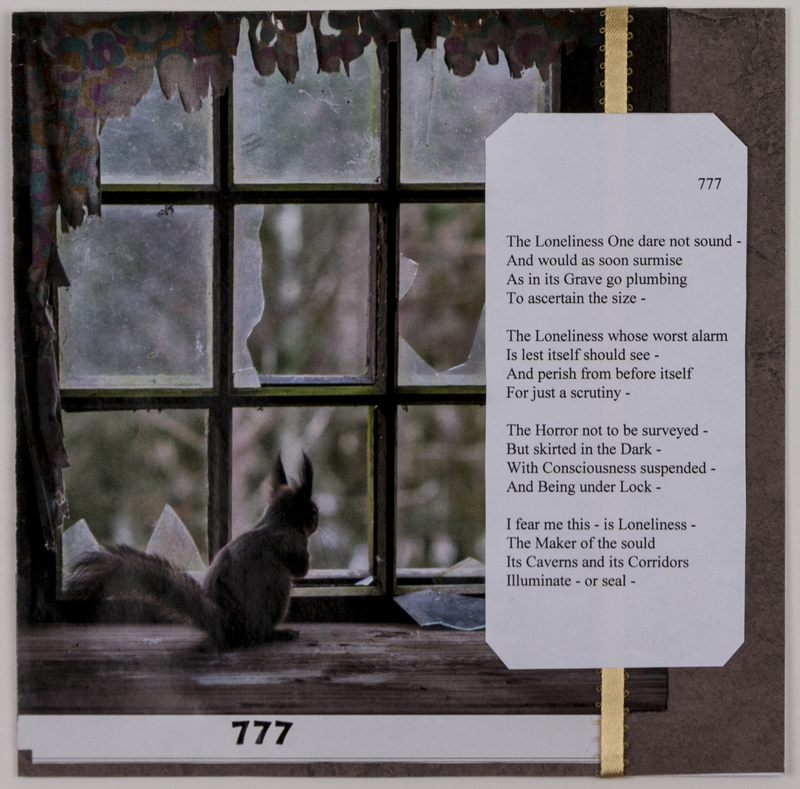 This poem was an excellent selection because the alternate meanings were consistently interesting and plausible choices, especially at the last of the sliding panels, which had five alternate words in play, some of them significantly shading both the sense and the sound of the poem itself. This was public education at its best. As soon as we left the Homestead itself, we walked out in the warm, bracing noonday air for the short walk to the Evergreens. On this transit we walked along Main Street, giving us a good view both when looking back at the Homestead and ahead to the Evergreens. It also offered a chance for a few photos of our little group of pilgrims. Any reader of Part 3 of this blog is likely to recognize Claire Illouz among her companions. 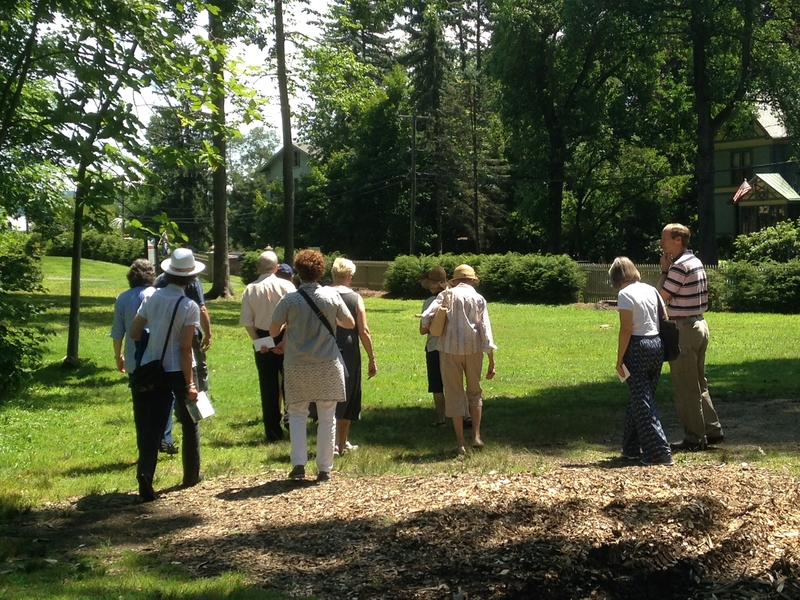 The Evergreens is an amazing time capsule going back to the last of the 19th century and beyond. 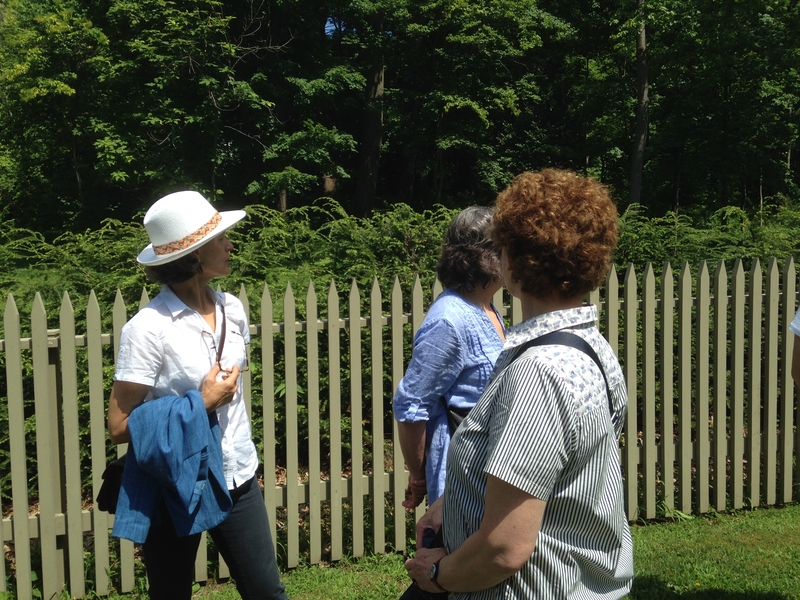 I learned more about Martha Bianchi’s husband’s role in preserving the place in the hands of the family until quite recently. It’s always great to enter the big sitting room filled with furniture and paintings and prints that Susan Gilbert Dickinson had collected, many of which would have been familiar to Emily in the early years of her brother and friend’s marriage. A landscape by Kensett is currently in pride of place, directly in front of where we visitors were standing. I was particularly interested in the highest of the two paintings on the far right wall, a landscape bisected by a river with a mountain centered in the backgrouind. I would have liked to see it up close, and asked Greg’s assistant if she could identify it in the documentation she had in a binder. 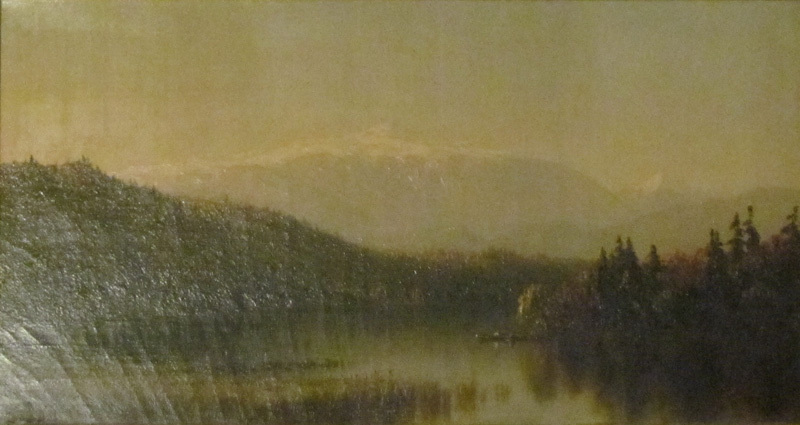 She quickly identified it as Autumn Evening in the White Mountains, painted by Sanford Robinson Gifford in 1858, just when Emily Dickinson was beginning to find her voice as a poet. Greg mentioned that all of the paintings and prints in the Evergreens can now be seen online. I will post here its image for the Gifford, a ghost image just enough to make you want to see it up close in person, not at an angle from far across the room. One of the first Dickinson poems that Johnson attributes to 1858 begins: “I never told the buried gold / Upon the hill—that lies— / I saw the sun—his plunder done / Crouch low to guard his prize” (J 11). In the sitting room across the entry hall, Greg rightly emphasized the fun that was had there, the revels even, in which Emily held her own in the earlier years. Claire was very taken with a number of the artworks in the room, including the etching of a breaking wave on the wall directly behind us. She recognized some of the orientalist images Susan had collected as reproductions. Greg knows a lot about the art throughout both houses, which is one reason I learned a lot more this time through. Our next stop was the amazing dining room, with the pristine wood beam ceiling Austin had commissioned a century and a half ago. It’s always fun to hear about—and see—the wires that were activated to call the servants into the room. On this visit the lavishness of the meals served at this table, on this china, was demonstrated by the printed menu for a dinner party given during Valentine’s week back in Susan’s day. 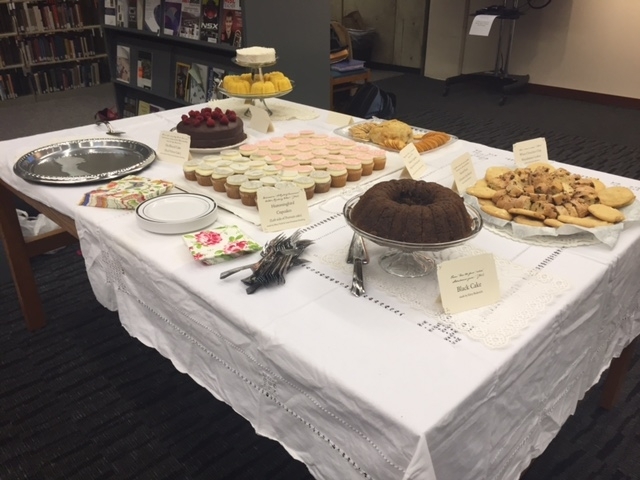 The woman in our group who volunteered to read the menu out loud did so with great enthusiasm—which caused me to say a few words about the Emily Dickinson Tea Party featuring the poet’s own recipes we held on Valentine’s Day in February of this year to conclude our Dickinson Arts Fest in northern Kentucky. Claire was very interested in the beautiful cast-iron stove, the large upright rectangular ice box, and various implements in the scullery. Greg did a nice job of giving us the architectural context of how this very sophisticated dining room had been an add-on to the original house, whereas the much more modest kitchen was the makeover of an adjacent cottage. Upstairs quite a bit of renovation is under way to stabilize the ceiling in the hallway and the children’s room, each of which has small wooden pegs crossing various cracks. Seeing this room in which young Gilbert had died was much more poignant for me this time—after my student Keianna Troxell had created Gib’s Room: Formal Feeling as her final project during the 2014 Spring Semester. I was now looking at the very photographs on the back of a door in this room that Keianna had gotten permission to collage over a rare surviving photo of Gib himself. 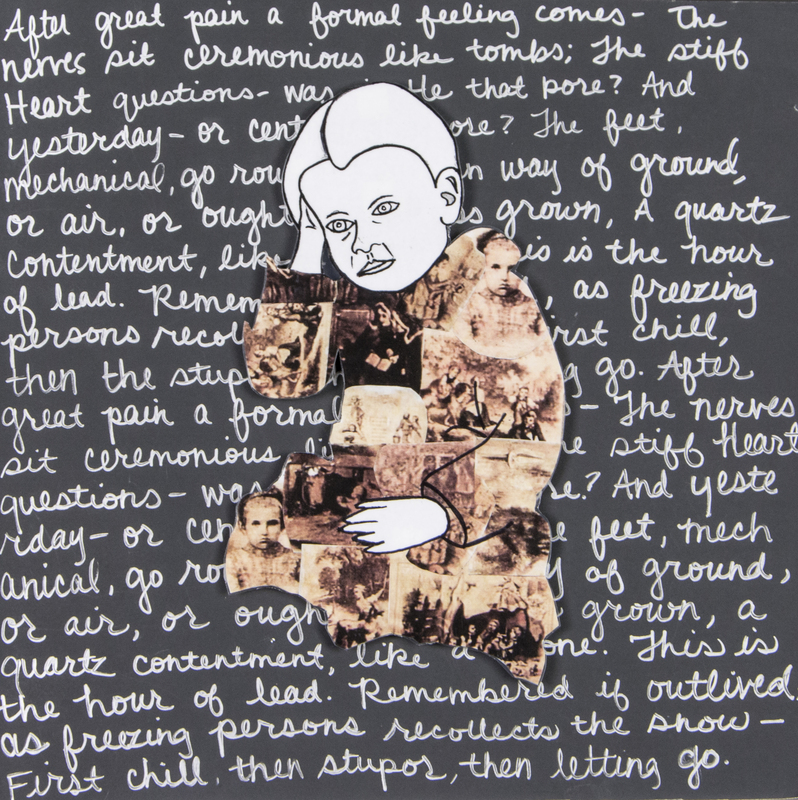 She had then inscribed Emily’s poem “After great pain a formal feeling comes” on the black ground over which she imposed the collage. I could not take a photo of the actual photos on the back of the actual door, but I can post Keianna’s artwork here, along with the wish that she could have been with me to look into this room together. The tour ended in the former master bedroom after we had returned to the main floor. As we sat on benches perfectly sized to hold us all, Greg held forth on as much as he had chosen to reveal of Mabel Loomis Todd, Austin, the War between the Houses, and the ongoing aftermath of that. Considering the complexity and volatility of all he had to deal with, Greg did a great job with this, as with everything else, having planted subtle seeds for what he was now revealing along the way. 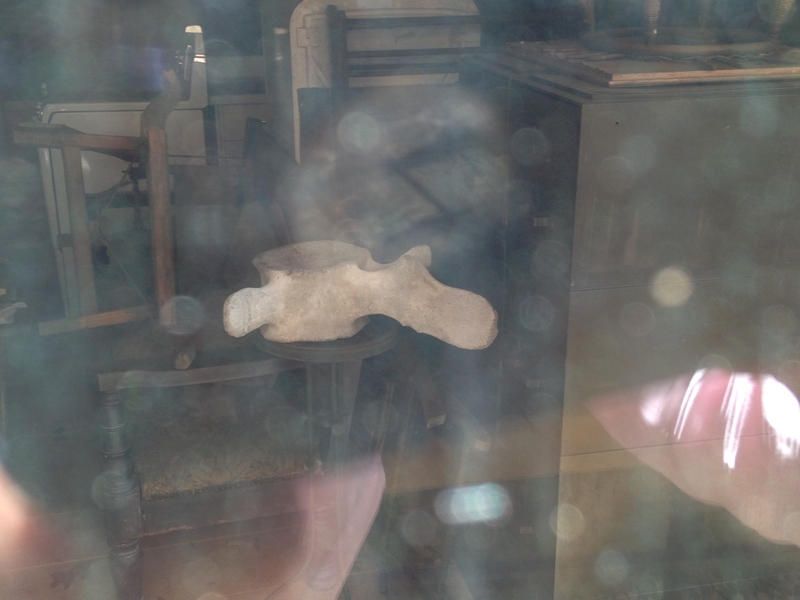 As we filed out of the Evergreens at the end of this home tour, Claire noticed something interesting through a window in a storage structure: the vertebrae of a whale. We asked Greg about it and he said these were often used as garden decorations in the mid-nineteenth-century. He did not know of any current plans to move this one into the garden here. I was glad when he said, since we were now out of the house, that it would be ok to take a photo of it through the glass. If we ever have a Dickinson and Melville conference here in Amherst, this piece of a whale would provide an unexpected link between the two artist’s lives. The tour had not quite ended. Greg, as we gathered for the last time back near the Homestead, told us of Emily’s death and of how precisely she had choreographed her funeral procession, passing by a number of beloved spots on the family property in such a way as to not lose sight of the Homestead until they passed over the hill to the gravesite. So we can think of her in spirit honing in on her Homestead home even though, in the corporeal sense, she could no longer “see to see” (J 465, “I heard a Fly buzz—when I died—“). 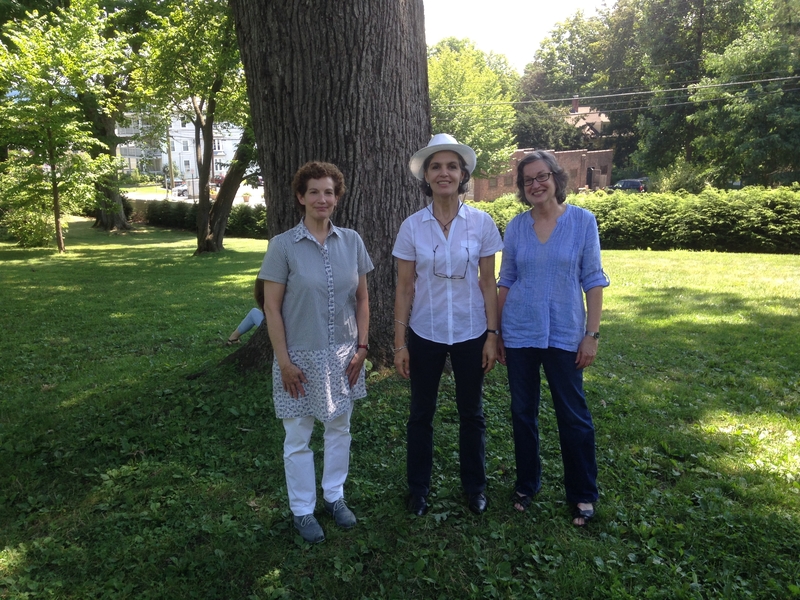 Before leaving the Homestead our group of four took some photos in various combinations in front of a massive oak tree, near the garden, that probably dates from Emily’s own day. I loved the fact that a young woman was reading as she sat against the base of the tree on the other side. I hope the photos show her. Marsha’s car, parked at a meter on Main Street, had been in the sun all morning, so before we went to lunch Claire transferred her things from the trunk of Marsha’s car to the trunk of mine, as she had brought a couple of things she wanted to keep as cool as possible. I moved my car forward a few spots on a side street so it would remain in the shade while the four of us had lunch at the first place we found inviting as we walked up Main toward South Pleasant. That place was the Black Sheep, a phenomenal sandwich shop that did not mind our sitting at a table for two hours as we shared our impressions of the tour (we had all been deeply impressed) and other common interests (there were many). At some point Claire remembered that her mother would be expecting her before too long at her cottage near Tanglewood, so we took highway 9 west, I-91 south, and I-90 west, arriving att the cottage shortly before 6 pm. Our day at Tanglewood began last night at the cottage with Betsy, even though the concert itself was not until the next day, this morning.